A while ago, I wrote a post that examined, in much greater and (slightly) more accurate detail what speeds my 2007 Toyota Yaris, with its stock drivetrain, could manage under different conditions. This post is all about Earth at sea level, which has gotta be the most boring place for a space enthusiast. Earth at sea level is what rockets are built to get away from, right? But I can make things interesting again by getting rid of the whole “sensible stock drivetrain” thing. Its stock four-cylinder engine produces about 100 horsepower and about 100 foot-pounds of torque. My drivetrain has the following gear ratios: 1st: 2.874, 2nd: 1.552, 3rd: 1.000, 4th: 0.700, torque converter: 1.950, differential: 4.237. The drag coefficient is 0.29 and the cross-sectional area is 1.96 square meters. The wheel radius is 14 inches. I’m totally writing all this down for your information, and not so I can be lazy and not have to refer back to the previous post to get the numbers later. Anyway…let’s start dropping different engines into my car. In some cases, I’m going to leave the drivetrain the same. In other cases, either out of curiosity or for practical reasons (a rarity around here), I’ll consider a different drivetrain. As you guys know by now, if I’m gonna do something, I’m gonna overdo it. But for a change, I’m going to shoot low to start with. I’m going to consider a motor that’s actually less powerful than my actual one. There are people out there who do really high-quality gas-to-electric conversions. I don’t remember where I saw it, but there was one blog-type site that actually detailed converting a similar Toyota to mine to electric power. That conversion involved a large number of batteries and a lot of careful engineering. Me? I’m just slapping this random go-kart motor into it and sticking a couple car batteries in the trunk. The motor in question produces up to 4 newton-meters (2.95 foot-pounds). That’s not a lot. That’s equivalent to resting the lightest dumbbell they sell at Walmart on the end of a ruler. That is to say, if you glued one end of a ruler to the shaft of this motor and the other end to a table, the motor might not be able to break the ruler. But I’m feeling optimistic, so let’s do the math anyway. In 4th gear (which gives maximum wheel speed), that 4 newton-meters of torque becomes 4 * 1.950 * 4.237 * 0.700 = 21 Newton-meters. Divide that by the 14-inch radius of my wheels, and the force applied at maximum wheel-speed is 59.060 Newtons. Plug that into the reverse drag equation from the previous post, and you get 12.76 m/s (28.55 mph, 45.95 km/h). That’s actually not too shabby, considering my car probably weighs a good ten times as much as a go-kart and has at least twice the cross-sectional area. For the electrically-inclined, if I was using ordinary 12 volt batteries, I’d need to assemble them in series strings of 5, to meet the 48 volts required by the motor and overcome losses and varying battery voltages. One of these strings could supply the necessary current of 36 amps to drive the motor at maximum speed and maximum torque. Ordinary car batteries would provide between one and two hours’ drive-time per 5-battery string. That’s actually not too bad. I couldn’t ever take my go-kart Yaris on the highway, but as a runabout, it might work. As I’ve noted more than once, human beings like to make things go really fast. Part of me thinks that’s because we’re hunter-gatherers by nature, and somewhere deep in our limbic systems, we think that if we can make it to Mach 3, we’ll finally catch that damned antelope. The other part of me thinks we like it because it’s AWESOME! But that’s just the record for the fastest land vehicle with a person inside it. 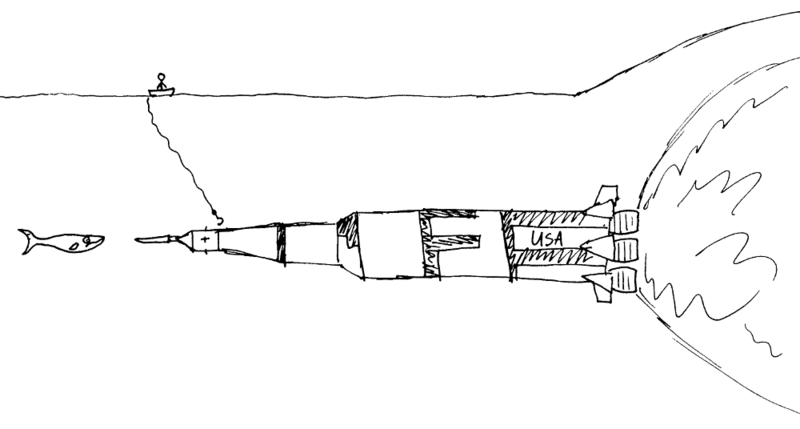 The ultimate land speed record, as far as I can tell, is held by a multi-stage rocket sled at Holloman Air Force Base, which deals with creepy secretive things. Their rocket sled reached Mach 8.47, or 6,453 mph (or 10,385 km/h, or 2,885 m/s; why are there always so many damn units…). They’re not saying why, exactly, they’re accelerating a rocket sled to railgun velocities, but they’ve done it. There’s no theoretical reason a human being couldn’t go that fast. (There are lots of practical reasons, but I’ve never let that stop me.) In fact, there’s no theoretical reason a land vehicle couldn’t go much faster. Technically speaking, if we ignore aerodynamic effects (which we theoretical types always do, which is why there are engineers to explain to us that astronauts don’t like burning up in the atmosphere), the fastest a land vehicle could ever go is 7.91 kilometers per second. That’s orbital speed at sea level. It’s Mach 23. This is the speed at which the centrifugal acceleration from traveling around the circular earth exactly balances the acceleration due to gravity. To put it another way, this is the speed where your vehicle becomes weightless, and if you go any faster, you’re going to leave the ground. 7.91 km/s is fast. Here’s a good way to understand just how fast it is. Say you’ve got a really good reaction time (around 100 milliseconds; let’s say you’ve had a lot of coffee). If you were trying to time this ultimate land-speeder on a 1,000-kilometer track (about 10 football fields end-to-end) with a stopwatch, the speedy bugger would have traveled from the beginning to the end of the track by the time your brain noticed that it had entered the track, processed the fact, and sent the signal to your finger to press the button on the stopwatch. It wouldn’t matter, of course, because you’d be obliterated by a superheated shockwave a moment later. But even 7.91 kilometers per second isn’t the ultimate limit on land speed. As a matter of fact, if you have a vehicle that can reach that speed anyway, it’s going to have to have some aerodynamic surfaces on it to keep it from lifting off the ground and turning into the world’s fastest plane. But, while we’re adding downward thrust (in the form of aerodynamic lift, or perhaps I should say anti-lift), why not go all the way? Why not put some rockets on this thing and make it stay on the ground? The fastest a human being could reasonably expect to travel across flat ground and survive is 23.7 kilometers per second. Before I get into explaining just how horrifically fast that is, and why you can’t go faster than that without killing the pilot, I want to paint a picture of the vehicle we’re talking about. In all likelihood, it looks more like a plane than a land vehicle. It’s got some sort of massive engine on the back that burns sand to glass behind it. 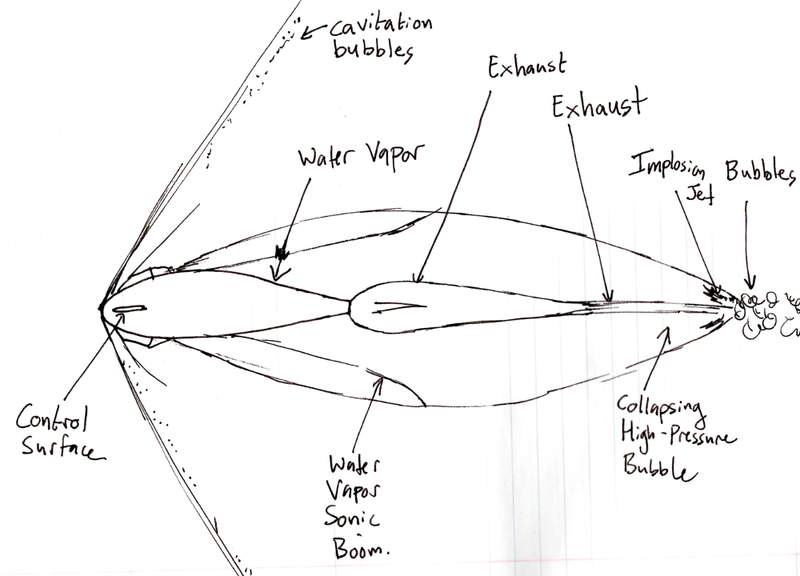 It’s got enormous wings to keep it from bounding into the stratosphere. It’s got rocket motors mounted on the tops of those wings. And we’re not talking wimpy JATO motors. We’re talking ballistic-missile-grade motors. Motors powerful enough that, if you just strapped a human to them, the human would have a hard time staying conscious through the acceleration. The cockpit’s weird, too. It’s a sort of pendulum, with a reclined seat aligned along the axis of rotation. Because of the pendulum arrangement, the seat rotates so that the occupant always feels the acceleration as vertical. You could be forgiven for thinking this is some kind of Edgar Allan Poe torture device. I’ll explain all that in a minute. But for right now, I want to convey to you how fast 23.7 km/s is. It’s the speed of extinction-triggering asteroids. It’s Mach freakin’ 71. It’s twice as fast as the crew of Apollo 10 (the holders of the ultimate human speed record) were moving on their way back to Earth. It’s faster than both the Voyager probes and New Horizons. Matter of fact, there are only two human-constructed objects that have ever gone faster than this: the amazing Galileo atmospheric probe, which dropped into Jupiter’s atmosphere so fast that all the speeding bullets in the world momentarily blushed (47.8 km/s, for those who don’t like overwrought metaphors), and the equally amazing Helios 2 probe, which holds both the record for the fastest human-built object and the human object that’s gotten closest to the sun (at perihelion, it was moving at 70.2 km/s; hopefully, NASA won’t can Solar Probe Plus and we can break that record). 23.7 km/s is one of those speeds that just doesn’t fit very well into the human mind, unless it’s the kind of human mind that’s accustomed to particle accelerators or railguns, and frankly, those minds are a little scary. At this speed, our peculiar death-trap vehicle could circumnavigate the Earth in 28 minutes and 9 seconds. It could travel from New York to Los Angeles in 2 minutes and 47 seconds. “But hell,” I can hear you saying, “we’ve already got a ridiculous impractical land-speed vehicle. Why not crank it up all the way? Why not go as fast as Helios 2? Or faster!” The problem is that I specified a vehicle being driven (or at least occupied) by a human being. Before I explain, here’s a video of a person making a very funny face. That’s a pilot in training being subjected to 9 gees in a centrifuge. You’ll noticed that he briefly aged about 60 years and then passed out. But he was being trained for practical stuff (that is, not blacking out when making a high-speed turn in an airplane). That’s boring. And, more relevant to our speed record, he was almost certainly experiencing gees from head-to-foot. Humans don’t tolerate that very well. The problem is that human beings have blood. (Isn’t it always?) When gee forces get very high, it takes a lot of pressure to pump blood to levels above the heart. Unfortunately, when you’re dealing with vertical gees, the brain is well above the heart, and all the blood essentially falls out of the brain and into the legs. (There are some ways to compensate for that, like with the weird breathing technique the trainee was doing and the pressure-compensating suits most high-gee pilots wear, but there are limits). But even if the gees were from back to front (that is, you’re accelerating in the direction of your nose), 9 gees would probably still be the upper limit. Because, even lying down, that acceleration is going to make the blood want to pool below the heart. It’s going to flood into places where you don’t really need it like your buttocks, your calves, and the back of your head. In fact, at 9 gees, you run a pretty good risk of rupturing blood vessels in the back of your brain from the pressure. But human beings can tolerate 9 forward gees for a few seconds, so we’ll pretend they can tolerate it for the 2 minutes and 47 seconds it takes to blaze from New York to LA. whose source material I unfortunately couldn’t verify, a human being can’t tolerate 10 gees for more than 10 seconds. A human can tolerate 20 gees for 1 second (this I know to be true, because lunatic rocket-sled pilot John Stapp did it; actually, he pulled 25 gees for a full second, and in spite of all his insane rocket-sled stunts, lived to be 89). And human beings have been known to survive 30 gees or more (up to about 100 gees) for very brief periods in car crashes. But trust me, the weird French organization that certifies land speed records (and air speed records, and altitude records) probably isn’t going to be very impressed by your traveling 50 km/s for a tenth of a second. If you want to go that fast long enough to actually get anywhere, you’re limited to 8 or 9 gees, and even then, you’d damn well better make sure your life insurance is up to date. So, unless you use weird technologies like liquid respiration (in which you breathe oxygenated liquid fluorocarbons instead of air, and which is a real thing that actually exists and is sometimes used for hospital patients with burned lungs) and those creepy full-body gee-tanks from Event Horizon, the 23.7 km/s land speed record can never be broken. Partly because of the gee-forces involved, but mainly because trying to go that fast on land is absolutely, certifiably insane. Tune in next time, where I get all gory and try to imagine what would happen to a human body exerted to much larger gee forces.